When the news came out several months ago that Starmarket was getting back together to play some shows focusing on the early material in their catalog, I was pretty upset that I wasn't in Sweden or Japan. 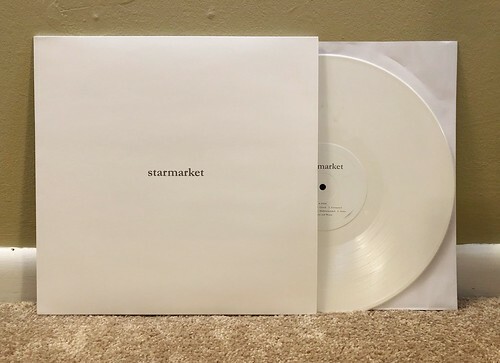 Those first two Starmarket full lengths are among my favorite records of all time. We were even lucky enough to release the US version of the band's second album, Sunday's Worst Enemy on PopKid. Their first self titled release hadn't been released on vinyl when it came out back in 1995, but the fine folks at Assembly Line records have issued in on wax in conjunction with the band's reunion. I still remember how completely blown away I was when I first heard this album. My buddy Alan played a few songs for me at the Flipside record store in NJ. When that machine gun guitar intro blasts out of the speakers in the opening track "Your Style," it still gives me chills almost twenty-five years later. The entire album is full of dynamic pop-core guitar that would make Bob Mould proud. Starmarket managed to harness so much energy into these songs. Even on the slower ones like "Parking Lot" and "Cozy and Warm" there's a palpable electricity that so few bands are able to achieve. This vinyl version sounds great. Every high hat is crystal clear and every bass line rumbles along with the sort of warmth that envelops the room. I really couldn't be more excited to finally add a vinyl version of this album to the collection. It's probably been one of the biggest omissions up to this point (still waiting for Onehundredpercentfreak by Alligator Gun though). I'm hopeful that a vinyl version of the Starmarket EP Calendar gets released (along with some extra B sides of the era would be nice). I also really hope that Sunday's Worst Enemy gets a proper vinyl treatment. While Dolores records put out a vinyl version of that album when it came out in 1997, it's a picture disc that frankly doesn't really sound that great. A better vinyl release would be a very welcome addition. Just got my copy last week after Starmarket randomly appeared on my Instagram feed. Excited to hear they are back together performing...hopefully not just a one-off and we can get some new tunes in the future. Best band.